The world continues to change, but all we need are a few simple tools to keep up. One tool that no self-respecting office can survive without is the rubber band. Sure, paper clips and staples provide superior fastening capabilities, but nothing supersedes the flexibility offered by a wide array of well-manufactured rubber bands. The rubber band market has grown exponentially since our grandparents slogged into the office for their 9-to-5 career building grind. Selecting proper bands of rubber tends to be frustrating without proper background, training, and support. Herein we present a compendium of the best selling continuous stretchy strips for home and office use. Read what we have written, then order some rubber bands online. The products are lightweight, easy to pack, perfectly legal in all 50 states, and socially acceptable in most civilized parts of the Earth. We're here to help. Any successful office was founded on a wide variety of fastening products: among them a handy bag of rubber bands. Along with staples, paper clips, adhesive tape, and glue sticks, the generic bag of bands is a must-have in every office supply cabinet. A well-run office could very well ground to an untimely halt without these amazingly unique products. This bag of rubber bands includes scientifically selected and assorted sizes that will comfortably bind all manner of office bindables. A tasteful neutral color complements each individual oval strip of elastic material. Order several bags because office workers inevitably grab the most useful sizes and leave the too-big and too-little bands for unfortunate employees who tarry. Natural colored rubberbands in assorted sized for your fastening needs. Use for projects, organization, and more. Here's the ultimate solution for your doodads, gewgaws, knickknacks, lagniappes, and rubber bands. You'll never again find yourself farther than arms' length away from something to wrap around something else. The Dooddad Cup is crafted by sophisticated manufacturing techniques and is suitable for any desktop. Even the most self-obsessed Wall Street titan of industry secretly loves to have at least 3 of there scattered throughout their workspace. Not recommended for coffee or other liquefied office materials. Add a little color to your fastening strategies with this matching set of rubber bands. Everyone in your office will be insanely jealous of your personal stash. You can stock the entire office with several packs of these bands, but they will vanish as quickly as your coworkers can saunter from the water cooler to the supply cabinet. Swingline provides an epic line of staplers, but not everything can be stapled. Pencils, pens, architectural drawings, and open bags of Frito's do not lend themselves to staples. Consider wrapping your loose office supplies in color-coordinated bands of rubber retrieved from this collection. Each pack contains over 74 bands. Use the attractive plastic shipping container (included with each order at no additional charge) to conveniently store your unused product. Inspired by the classic Rubber Band Ball Leagues of The Industrial Age, these very cool products concurrently offer utility and playfulness. Toss them around the cubicle farm for exercise. Roll them under the boss's feet as he strides purposefully toward his Mercedes in his reserved parking space. Peel off a single rubber band to add to your portfolio of stolen office supplies: no one will miss it. Each ball contains a supply of colored rubber bands that seems as endless as your work day. You'll run out of career before you run out of bands. If your coworkers complain, remind them that a sphere is obviously the most efficient way to store anything, except cubes. They will quickly come to realize your organizational genius and you will be invited to dine with them at Applebee's. Rubber band ball is an efficient, easy way to organize rubber bands. Approximately 270 bands per ball. Comes in assorted colors. Box. Ball size: 3.25" x .125". it's difficult to imagine, but not everything in the average office can be stapled together. Some things are simply too big or too expensive to have holes poked in them with tiny strips of wire. To the rescue comes this fantastic set of extra-large rubber bands. These unique office accessories come in an attractive matching red color: if you break one, it's easy to replace it with an identically colored band. No one will be the wiser until they notice the huge bruise on your forearm given to you by the last band that snapped unexpectedly and nearly destroyed your Dilbert coffee mug. Each band is 7" in diameter and made from biodegradable components. Who knew that an average rubber band might not be the best thing for your physical well-being? Of course, we all know that any rubber band is good for soul, but it turns out that, like the office paper shredder or jackhammer, some rubber bands just might hurt you . These rubber bands have been designed to optimize your office-day productivity while putting as little stress as possible on your joints. They still stretch and they still grab at the little hairs on your arm, causing excruciating pain, but they stretch more easily than average rubber bands and they may reduce workplace repetitive motion injuries. If you find yourself deploying literally thousands of rubber bands each day, consider ordering a few thousand of these time-saving devices. They are especially useful for holding boxes closed, retaining large herds of free-roaming office pencils, and shooting from wooden rubber band guns. 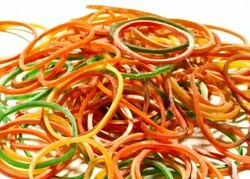 it looks like whole-grain rubber spaghetti, but it's actually a specially-designed collection of trash can rubber bands. These custom-made bands of stretchy material work hard to keep your trash can liner from dislodging and spilling broken rubber bands all over the office. A single bag of bands will restrain over 49 trash can liners, either concurrently or serially: the choice is yours. Order several packs for every floor of your office tower. Everyone wants their refuse properly controlled. Don't be the person in your office with a non-standard rubber band stretched around your trash can. Nothing satisfies like rubber bands purchased online. Keep your office running smoothly and efficiently. Don't face another day without back-up supplies of rubber bands. It hurts to run out of rubber bands. Thanks for sharing. How can I Advertise my Business for Free Online? Looking for 200 quick and easy ways to make passive income with not effort? Boy, have I got bad news for you. The internet is the most powerful tool for advertising any business and the good news is that you can get a whole lot of advertising, without spending a dime.